We are all aware that we should be drinking more water than we are probably doing, but the fact is water alone seems to be pretty boring. 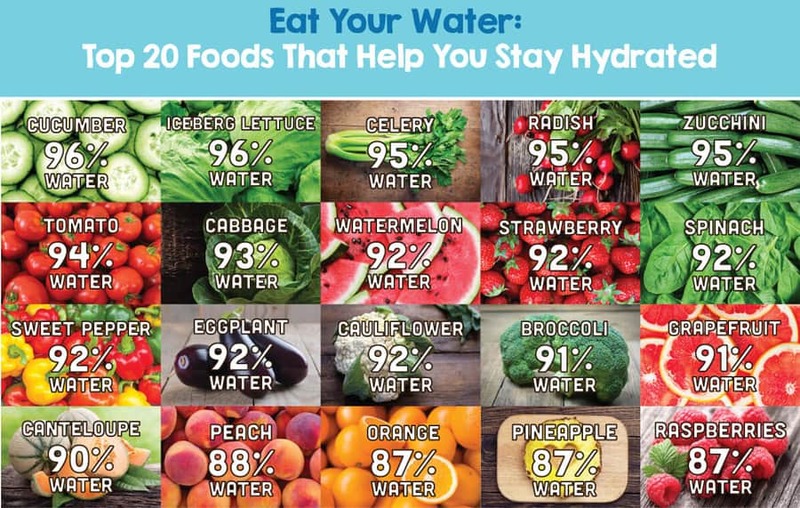 But what you probably don’t know is that staying hydrated does not only mean drinking water, and drinking water does not just quench your thirst. In fact, there are many ways to avoid dehydration besides drinking water, and there are a number of benefits of hydration. Basically, the human body needs water to maintain muscle function, immune health, digestion, mood and to protect the joints and brain. So many benefits in one term aren’t it? So In this “hydration tutorial,” I am going to walk you through a step-by-step instruction of how to stay hydrated throughout the day. Lose weight: Drinking water instead of sugary juices or soda will quench your thirst, and it won’t contain the excess calories. You’ll also be able to flush out by-products and other toxins from the body. Muscle efficiency: Being hydrated is essential for keeping your muscles strong lubricated and energized. Water will aid the transport of oxygen to your muscles, so they’re pumped up for exertion. Memory function: Proper hydration will upgrade the blood flow and oxygen flow to your brain, and strengthen cognitive function and memory. Joint lubrication: Your spinal cord, joints, brain, and eyes are surrounded and protected by water. Remaining hydrated is going to keep those joints healthy. Improve digestion: Similarly, water provides the ability to eat and digest food with ease thanks to the water both in your saliva and moving through your digestive tract. Better immune health: You should think of drinking water as your secret weapon fighting illnesses, improving lymph fluid within the immune system and preventing headaches, muscle weakness, joint pain, fatigue, and lightheadedness. Burnout: When the body suffers chronic dehydration, blood flow and blood pressure plummeted due to a lack of water and oxygen in the blood. This symptom causes muscles and nerve function to burnout. Concentrated dark yellow urine: It can be an early sign of dehydration which happens when blood pressure levels drop and the kidneys attempt to store water rather than expelling it. Lightheadedness: When your blood pressure drops due to dehydration, dizziness often kicks in suddenly if you stand up too quickly. Accelerated heart rate: Dehydration often causes electrolyte levels to drop followed by heart palpitations and a drastically increased heart rate. Perspiration: Fluid levels are necessary to keep body temperature regulated. When dehydrated the body tends to overheat, sweat and cause severe heat stroke. Muscle cramps: Hydration or electrolyte balance is essential for muscle contraction. So when sodium and potassium stores are low, painful muscle spasms can occur. Constipation: Water absorption is crucial for healthy bowel movements. That’s why when we’re dehydrated, we call them contract slower. Less water is absorbed, and your stools become hard and dry. Being thirsty: Once you’re far away to tell if you’re dehydrated is if you’re thirsty, your mouth and throat will become parched, and your tongue may swell. Prepare the bottle half liter size, which is light and small enough to carry around with a right amount of water. Then you add six rubber bands in the middle, and fill your bottle with water. When you finish the first round of water, take one of the rubber bands, put it on the top representing one complete round of water then you refill and repeat the process. It helps to actually see very clearly how much water you drink per day and helps you improve your water consumption. This creation becomes a small and fun little game for you, and the goal is to finish with all the rubber bands on top before going to bed. 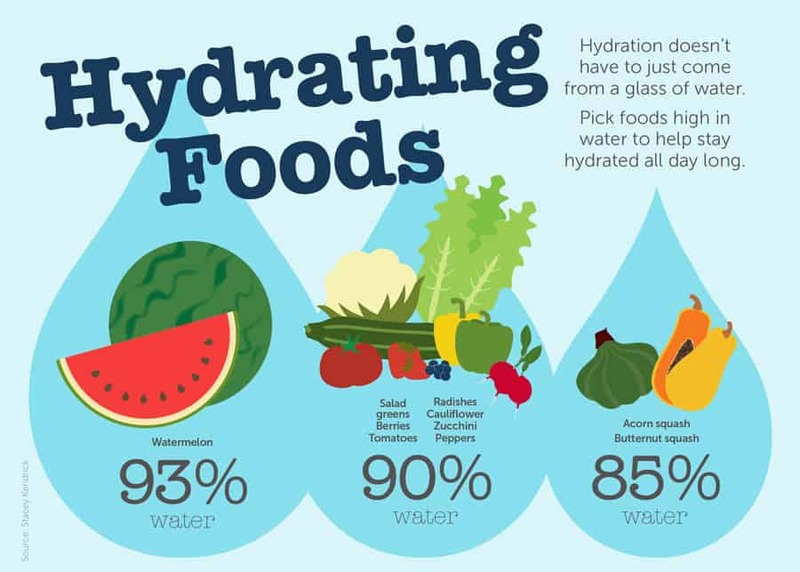 Besides drinking 1 liter of water every day at optimum, you can stay hydrated by consuming plenty of fruits and vegetables. These can actually substitute 20% of your liquid intake. Orange and coconut sugar: With about 93% of water, orange is also a source of Vitamin C and potassium. Cucumber and Olive Oil: Cucumber has more water content than any vegetable and fruit. This vegetable has 96% of water, no saturated cholesterol, and fat. It is also abundant for Vitamin B6, Vitamin K, and Iron. Strawberries and freshly cracked black pepper: Strawberry is a perfect treat for staying hydrated as it contains 92% water and is rich in Vitamin C and fiber. Watermelon and red pepper flakes: Watermelon has 92% of water. It is perfect for re-hydrating because of its high properties in Calcium, Salt, and Magnesium. This fruit also is very rich in Vitamin C, Vitamin A, and Potassium. You can drink skim milk or non-fat milk; they include a lot of water within them. They also contain a natural balance of carbon hydrates, protein, and sodium, which help the body to retain fluid. Aloe vera juice with pure coconut water. Something worth mentioning is hunger and thirst. Sometimes your body mistakes thirst for hunger. When you are thinking: “I’m hungry, and I need a snack,” you actually just might be dehydrated and need to consume water. You can either drink the water, eat some fruits or drink some other substitutions as mentioned above. So next time when you have the feeling of craving, take some water in and wait 15 minutes to decide. If you are still hungry, it’s time for a meal. Lastly, it’s important to check if you are hydrated throughout the days. If your urine is lighter in color, you are staying well. If it has a darker shade, you need to make sure to increase the fluids intake. You need to take in at least half of your body weight in ounces of water a day. 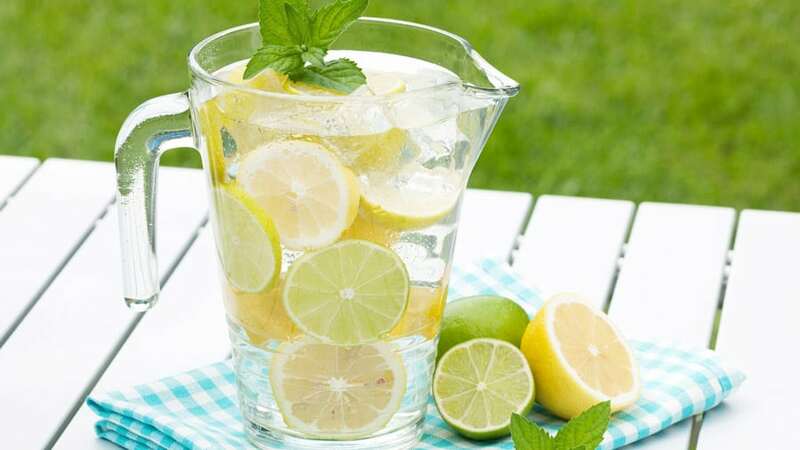 If you are a 200-pound man, the minimum you are going to consume 100 ounces of water per day. If you are exercising, you always need to add more in. How to Make it A Habit? Set an alarm. So for those of you who don’t carry a water bottle with you all day every day, you all have our phone, they all have the alarm on them. Set them, make sure every hour, you are taking in some water. If you forget to do so, you are probably sluggish and cramped up in the middle of your workout session. When Else Can You Drink? Before your meal. Having some water in before your meal helps keep you satiated, facilitate your digestion and keep you away from overeating, which surely is a big deal when it comes to weight loss. Is it Ok to Add Something into The Water? Yes, but just fruits are recommended. As drinking pure water can be boring, you can add some flavor to it by throwing in some slices of lime, blueberries, kiwi, etc. Another trick is that you can freeze your fruits in ice cube trays and then put those into the water. This way keeps the water cold and flavored at the same time. Sports Drinks are Efficient to Stay Hydrated? The short answer is yes because the main ingredient of those drinks is water, and you need water to be hydrated. 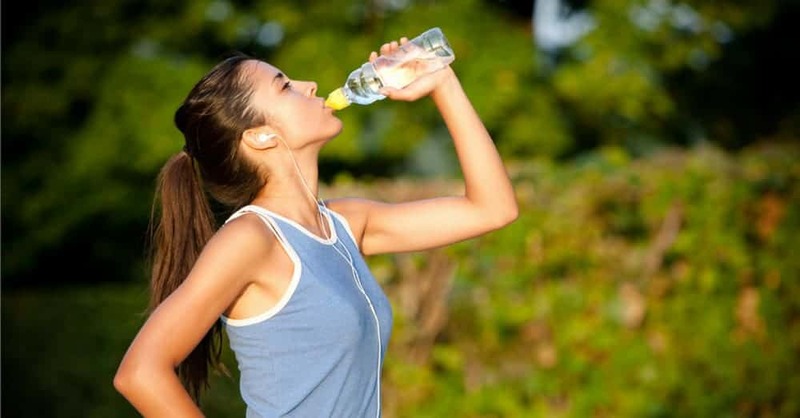 However, the long answer is that these drinks contain not only water but also mineral and sugar, and this can be beneficial during prolonged exercises. The loss of mineral is important, and sugar can improve the endurance. But for regular exercises, the mineral loss is small and adding sugar can add more unwanted calories, and it’s probably not optimal. As water is a part of your blood, your sweat, your muscles and your saliva, your whole body actually benefits from the amount of water intake. 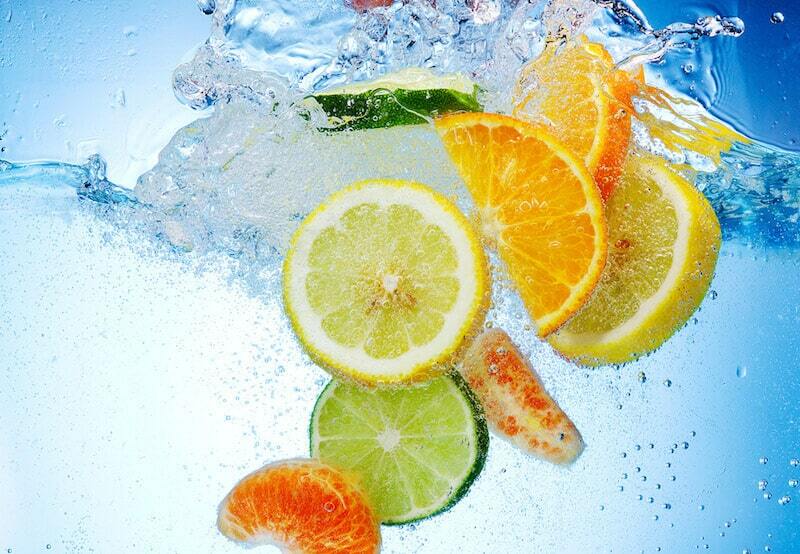 Consume more water, recommended fruits, milk, and juice so that your skin, your body and your mind will thank you. Hope this walkthrough will help you out in your hydration habits. And remember that staying hydrated is something really needs to be embed into your brain.